Science fiction has generally not (yet) proven to be a reliable predictor of the future. However, with hindsight, Hollywood has, on occasion, anticipated certain technological developments. Take the 1990 film “Total Recall”, set in 2084. This features Arnold Schwarzenegger at his action hero prime. Arnie gives full vent to his famously clunky acting skills as he navigates his way through a convoluted series of twists and turns on a mission to save Mars. It is glorious. During one scene, in a bid to evade the baddies, Arnie jumps into a “Johnny Cab”, essentially an autonomous taxi, complete with animatronic driver. Driverless taxis are now a reality, although minus the animatronic driver. They are being trialled in several cities, including London and Singapore. Large, influential corporations such as Google, Uber and General Motors are investing heavily in their development. An anticipated benefit of autonomous vehicles is a reduction in greenhouse gas emissions. Recent analysis suggests that autonomous taxis could provide a 90% reduction in US transportation emissions by 2050. This is a tantalising prospect. Reducing greenhouse gas emissions from personal transportation is thought to be a particularly difficult nut to crack. Transportation currently releases 14% of greenhouse gas emissions worldwide, a proportion with the potential to increase due to rising vehicle ownership. However, achieving such radical mitigation relies upon fundamental changes. One underlying requirement is that all autonomous taxis must be powered by electricity from greenhouse gas neutral sources. Another assumed impact is that widespread autonomous taxi deployment will cause a rapid decline in personal vehicle ownership and therefore reduce overall vehicle numbers. Other energy efficiency benefits derive from reduced congestion, fit-for-purpose vehicle sizes, higher average vehicle occupancy and more efficient, smoother driving style. To demonstrate, imagine that you and your partner have a lunch date on the other side of town. If you own a car, you will probably drive there and back. Your car will most likely have more than the two seats that you and your partner occupy and these other seats will remain empty during your trip. Whilst you eat lunch, your car will stand idle and empty. In an autonomous taxi utopia, you would not own a car. You will summon an autonomous taxi for the outward and return trip. Knowing that there will only be two passengers, a vehicle of suitable size can be designated for these trips. If there are any spare seats, your vehicle may identify people who are travelling in the same direction and stop to pick them up on the way. Your taxi may also be couriering items to the other side of town. During your journey, your taxi may slot into a “peloton”, or train of vehicles travelling in close formation to minimise drag and save energy. Little energy will be wasted idling, slowing or accelerating as “air traffic control” style technology will ensure a continuous flow of traffic. Traffic lights will be a thing of the past with minimal congestion at intersections. During lunch the autonomous taxi that delivered you to your destination will be occupied transporting other travellers or items. For those of us with a somewhat emotional attachment to our car, this picture of utopia may have a slight tinge of dystopia. Reluctance to relinquish personal vehicle ownership is one of many obstacles which challenge the purported potential of autonomous vehicles to mitigate greenhouse gases. Critics have also suggested that such easy access to personal “chauffeur driven” transportation may in fact significantly increase car use and exacerbate congestion. Returning to our friend Arnie, many practical and safety concerns are highlighted by his “Johnny Cab” experience, which does not end well (spoiler alert). Arnie vandalises the taxi when it struggles to understand his instructions and eventually gets out, refusing to pay. The cab then attempts to mow our hero down, subsequently crashing and bursting into flames. This somewhat unlikely sequence of events may be exaggerated but does prompt certain questions. How often will passengers abuse vehicles in the absence of a driver? Is there any risk posed by “rogue” vehicles that become unsafe due to software errors or hacking? 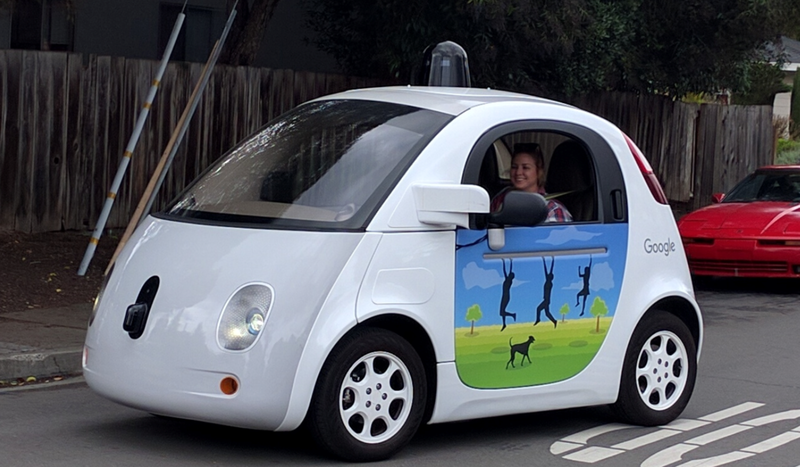 Predictions for when large numbers of autonomous vehicles will feature on our streets vary. Cautious forecasts suggest that 10% of global vehicles will be autonomous by 2035. Thus, the autonomous vehicle utopia I have described may still be many decades away, if it transpires at all. In the meantime, de-carbonising the propulsion of vehicles, whether autonomous or not, will remain the greater priority for mitigating greenhouse gas emissions from the transport sector.